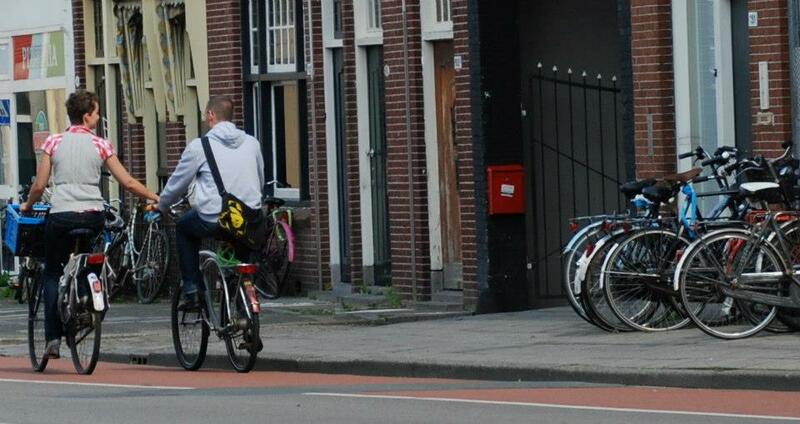 My fervent enthusiasm for the bicycle-way-of-life comes from my own perspective. I do not (yet) have children, and I rarely transport anyone but myself – save for a ‘double-bike’ if a friend has a flat tire or left their bike at the wrong location. And fairly, I often get the comment from friends (who are parents) who state, “That’s nice, but wait until you have kids.” Indeed I sympathize with such sentiments; having children adds an extra complication to the cycle-friendly lifestyle I take for granted. Interestingly though, this thought pattern often doesn’t resonate with the Dutch. 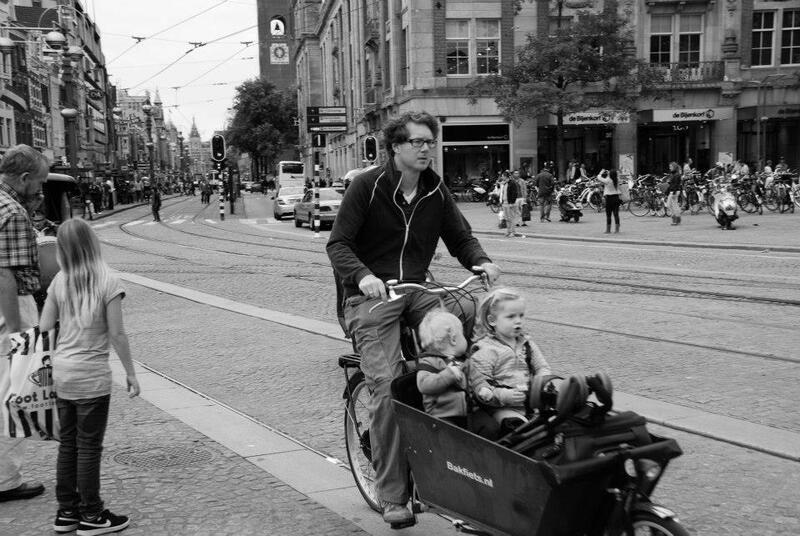 While traveling with children takes a bit more thought, it is just as common – or more common – in the city to see parents drop their children at school by bike than by car; or run errands with kids, pets and groceries in a bakfiets (carrier-bike). Infants are willingly strapped into ‘booster seats’ on the handlebar and daycare providers have 8-seater carrier-wagon cycles to take children out for a moving-recess. Who needs a playground or a car when everything is close by and children enjoy the fresh-air transportation and exploration? 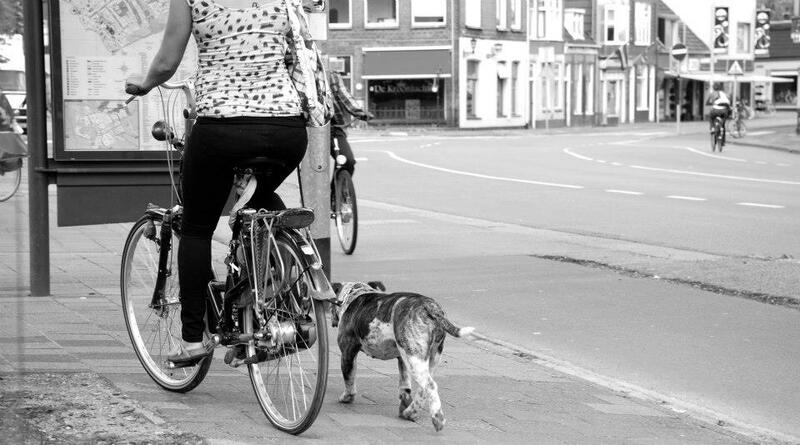 Of course, there are other reasons that facilitate a family-friendly cycling behaviour: urban planning tactics that facilitate safe cycling paths, air quality conditions, limited elevation change, relatively short distances and moderate temperatures. With such provisions, parents and children not only survive by adopting the bicycle as their main transport method bicycle, they thrive. After 2 years in the Netherlands and 3 years in Scandinavia before, it continues to fascinate and encourage me to see that this is possible. 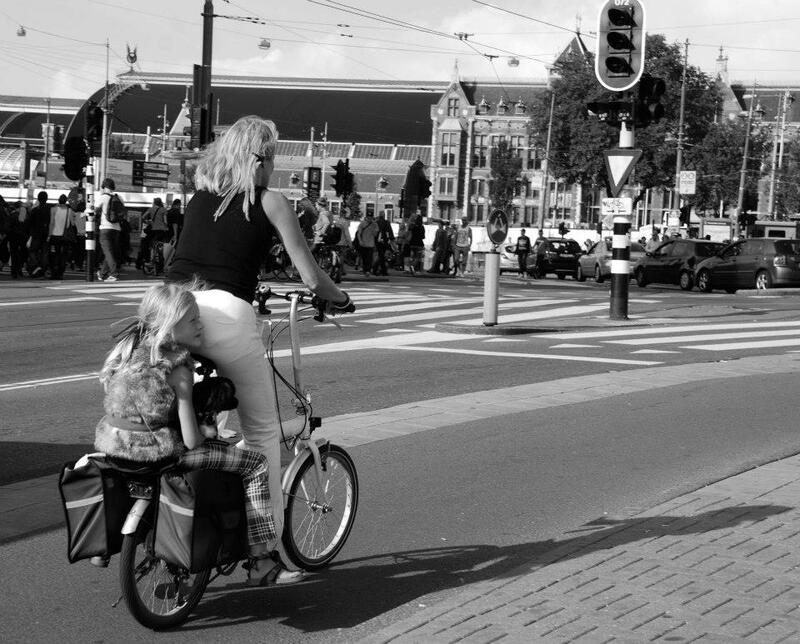 And, I’m not the only one… this cycling mentality is a photographer’s dream. 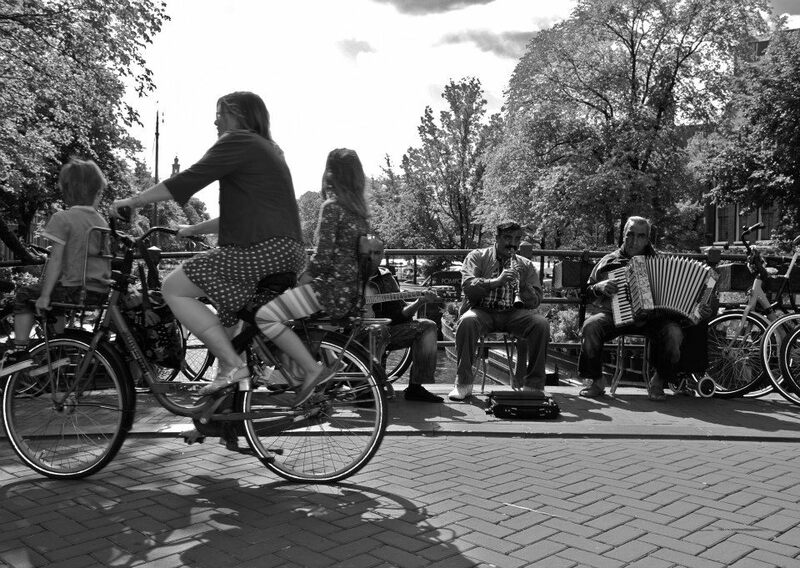 A friend of mine recently visited Amsterdam & Groningen and took the most beautiful photos of the lifecycle by bicycle: from young love, to pregnant women to mothers with one or more children on the same two-wheels. Perhaps someday, this will be a more common scene in other cities with similar geography and planning: here’s hoping. All the photographs in this post were taken by Emily Dumler. Here’s hoping! Great post Jen! i agree on your point about urban planning; Scandinavia and Holland are just in advance in terms of biking facilities, and there’s a good reason why i’ve never learned how to drive, considering i always settled in cities where biking and public transports were easy and cheap to access. Now that i am in the UAE, i just feel absolutely restricted: while i would normally love considering myself a pedestrian, i feel stuck because of distances (and heat). And while people drive, the population suffers from obesity and diabetes. However, the wind is changing somehow: bike paths for roadbikes are popping up in the desert (don’t ask…) and motion is now a key word in schools. Let’s see how it goes in the few months, the cities here are changing every day. certainly like what you’re stating and the way in which you say it. You make it entertaining and you still care for to keep it wise. I cant wait to read much more from you. This is really a terrific web site.